Junior Maria Grygleski dribbles past the defense. The Wildcats shot out of the gates this season to a 3-0 start, the best in school history. If last season is any indication, a strong nonconference record doesn’t guarantee season-long success for the Wildcats (7-1-2, 1-0-1 Big Ten). The 2014 team started fast, with a 4-1-1 record in nonconference play, before scuffling to a 4-6-3 regular season record in the Big Ten. But after success over the weekend, NU may be able to keep things rolling against conference opposition this season. The Cats won at Purdue (6-3-0, 0-1-0 Big Ten) Friday, 1-0, and followed that with a double overtime tie against Indiana (3-3-4, 0-0-2 Big Ten) on Sunday, 1-1. Against the Boilermakers, freshman Brenna Lovera came off of the bench to score the lone goal of the game, and NU clamped down from there to secure the victory. Sophomore goalkeeper Lauren Clem blocked Purdue’s three shots on goal to record the team’s sixth shutout of the season and snap an 11-game losing streak for the Cats against the Boilermakers. Riding high after Friday’s victory, NU took 20 shots in Sunday’s match against the Hoosiers but found the net only once, as senior midfielder Niki Sebo finished with a header off a corner kick by fellow senior midfielder Nandi Mehta in the 46th minute. But the Cats’ inability to finish chances kept Indiana in the game, and the Hoosiers tied things up with a goal by junior Lauren Joray in the 79th minute. The two teams traded chances in the overtime periods, but neither netted a winning goal, sealing the tie. 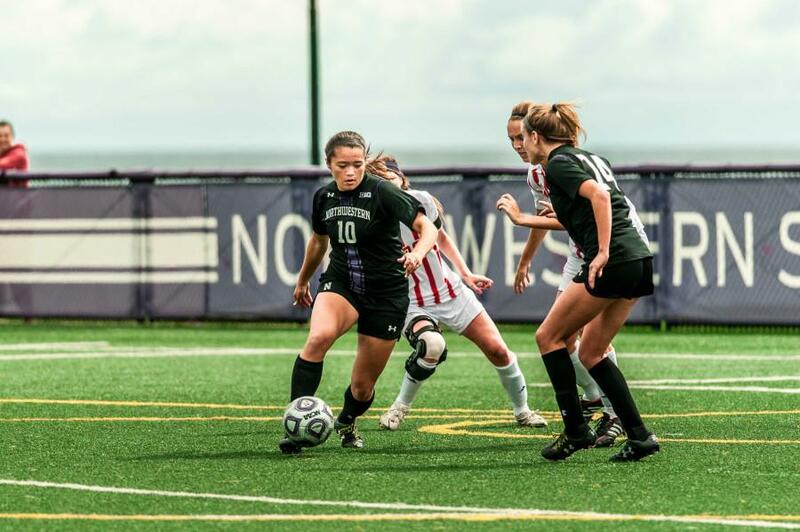 The weekend’s results showed off the strengths NU has displayed all season, with a terrific defensive effort supplemented by an offensive spark from junior forward Addie Steiner. NU has been rock-solid in the back, allowing .4 goals per game. The defense, spearheaded by Clem, has allowed goals on a miniscule 4.2 percent of its opponents’ shots on the year. Steiner has been NU’s premier offensive threat on the season, sharing the team lead with two goals on a team-leading 42 shots. Although she didn’t score in the weekend’s games, she was still active, assisting on the game’s only goal for her fourth assist of the year before tallying a whopping 10 shots against the Hoosiers, four of them on goal. This is a young team, with 11 freshmen on the roster, and the team has struggled to finish the chances it has created so far this season, with only 9.6 percent of its shots ending up in the net. Those factors haven’t prevented the team from finding early-season success, though, and the players are well aware that for a team that has struggled in recent memory, this season has been different and could become something special. “This is basically the best start to a season we have ever had,” sophomore forward Maria Fayeulle said, noting this marks the first time in program history the Cats started 3-0.